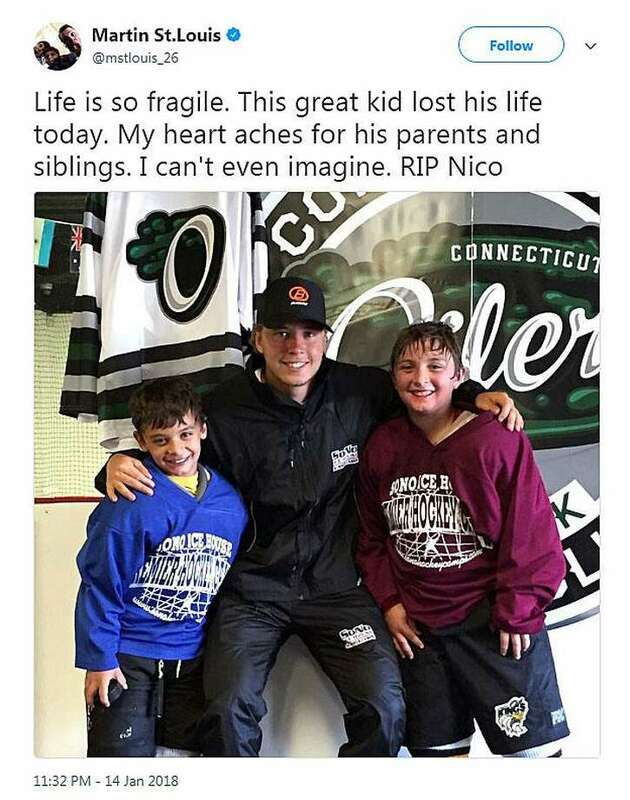 Martin St. Louis, a former NFL star that played 1,000 games and scored 1,000 points in his career, tweeted out his condolences in the death of 10-year-old Nico Mallozzi of New Canaan on Sunday, Jan. 14. NEW CANAAN, Conn. — A popular West School fourth-grader known as being the voice of the afternoon announcements is being mourned across the region after dying Sunday morning at the age of 10. Nico Mallozzi, who officials say had the flu at the time of his death, died after returning from a New York hockey tournament. According to Luizzi, the cause of death is being determined, but it was confirmed Mallozzi had the flu when he died. Reed said a report on the fourth-grader’s cause of death, currently ongoing, would have all the facts once concluded. Reed recommended anyone who had been exposed to the children should consider discussion of further flu treatment of Tamiflu, an antiviral drug, with their doctor. “This has been one of the worst flu seasons and I think it will continue until March,” Reed added. On Monday, the schools held a private gathering to support members of the community shaken by Mallozzi’s death. Afterwards, many mourners attended a small service at Saint Aloysius Parish held in wake of the tragedy. According to the Saint Aloysius Facebook page, Mallozzi was a religious education student at the church. “We had a good number of parents, students and staff come in to be there for one another, love one another and show support,” Luizzi said. The superintendent also met with clinical team members from across the district on Monday to discuss the next steps for the district to support students and staff. Luizzi has also been in touch with the Mallozzi family and said the district is doing what they can to support them during this time. “We’ve got students as young as kindergarten and first grade who’ll feel the loss,” Luizzi said. Mallozzi has siblings at West School and Saxe Middle School. Luizzi said emails will be sent out to West School parents explaining the situation, followed by an email to parents across the district. Clinical staff will be on hand for students when classes resume after the long weekend on Jan. 16. Members of the community also expressed their condolences to the Mallozzi family via Twitter. According to a tweet from Xavier High School Headmaster Dave Eustis, there will be a moment of silence held in Mallozzi’s honor at the New Canaan/Xavier game on Jan. 16. Mallozzi was a member of Connecticut RoughRider Hockey Club. The organization shared a message with players and families to inform them of Mallozzi’s death. A GoFundMe created on Jan. 15 for the “Nico Mallozzi Memorial Fund,” meant to support the family and created by someone in the hockey community, raised $500 about 30 minutes after being created.